The Test of English as a Foreign Language (TOEFL ibt or itp) is a test which measures people’s English language skills to see if they are good enough to take a course at university or graduate school in English-speaking countries. It is for people whose native language is not English. TOEFL scores are increasingly and predominantly accepted by US colleges and universities. Brighter Prep Dubai’s TOEFL course offers comprehensive preparatory programs for the TOEFL examination. Brighter Prep offers TOEFL preparatory courses in Dubai, Abu Dhabi and Istanbul. 3 types of TOEFL preparatory courses are offered: Group course, Individual course and Hybrid course. A TOEFL diagnostic test precedes each student’s admission into the TOEFL preparatory course. The TOEFL, Test of English as a Foreign Language, assesses the English language ability of candidates looking at studying in English speaking countries. It is one of the two major language tests accepted across the world, the other one being the IELTS. As opposed to the IELTS, which is a 2 hours 45 minutes test, the TOEFL takes 4 hours to complete. The four sections are the same, focusing on Reading, Writing, Listening and Speaking skills. Each section receives a score ox maximum 30, and the 4 tests are then added towards the final score, which is out of 120. Each university has its own required minimum score, which can range from as low as 61 to as high as 110. The TOEFL is administered as an Internet Based Test, although specific locations around the word still use the Paper Based Test. The TOEFL score is valid for up to two years. TOEFL test is available in 2 different formats. TOEFL IBT (Internet based test) that is being brought in around the world which measures listening, speaking, reading and writing. The most commonly used format. TOEFL ITP(Institutional Testing Program), is the one you should not consider if you plan to study abroad. Struggling to do the TOEFL IBT? Check with your local university of choice to see if they accept the TOEFL ITP. In the UAE, this exam is commonly known as “the local TOEFL”. It is only use by certain local higher education facilities to test their own students and is NOT accepted by other local higher education institutions as proof of their English ability nor by international universities. For those you will need to take the TOEFL ITP. The scores may vary: 200-500 is the range for the beginner/intermediate level scale and 310-677 correspond to an intermediate/advanced level scale. ITP tests are conducted on the campus of the individual relevant universities or can be done at AmidEast either in Abu Dhabi or Dubai. Brighter Prep is able to assist you to prepare for this test by conducting 30 hours of instruction which includes study materials and mock exams. TOEFL Ibt Group, Hybrid & Individual Courses in UAE. Each week the classes shall focus on one particular module. Each module has different structures and skill sets that are required and as such the classes are designed to cater to the requirements that need to be met. Brighter Prep’s Hybrid course is very popular with the students. It is not only cost-effective but also provides flexibility and efficiency of individual sessions. Individual Course allows for customization per the needs and requirements of the students. We offer the needful flexibility in terms of the number of sessions, length of each session and the time of the session(s), but it’s based on availability of Trainers. We invite your suggestions, queries and feedback. This will help us to serve you better. I got a 110 as a score. Just got my TOEFL iBT score, and thankfully I got a 119! 🙂 I got a 29 on the reading and 30s on all the other sections. Thought I would let you know because I couldn’t have done it without all your help and support. Have a nice weekend, and I’ll drop off the TOEFL book I borrowed sometime in the coming week. 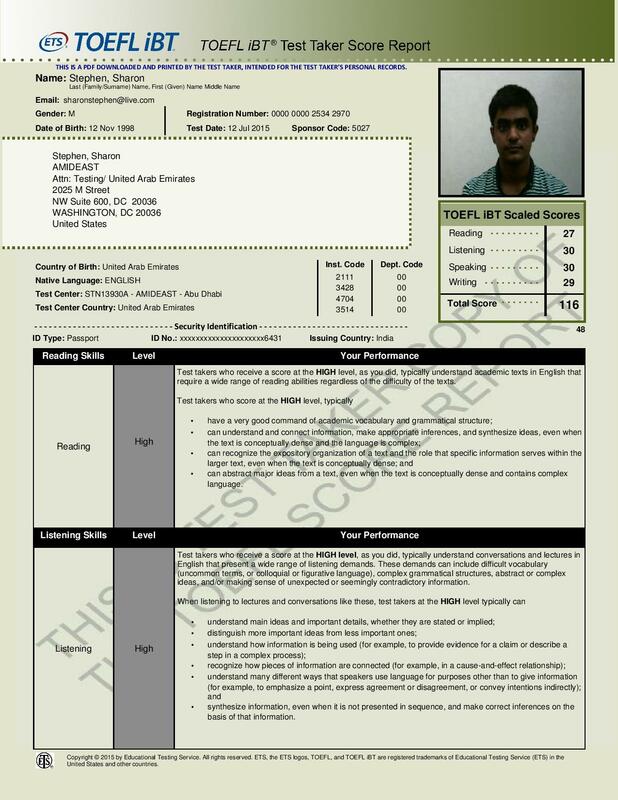 My Name is Sharon Stephen, Scored TOEFL- 116/120 but my other Friends at Brighter Prep Scored 118/120 & 119/120. We all Recommend .